I'm not a big fan of expansions. Often they add a lot of unnecessary bloat, with new rules, and new options, that dilute the original game and detract from the core beauty that made me enjoy that game in the first place. Plus, I have real trouble writing reviews for expansions. I have already used up all my "witty" jokes and "meaningful" insights in the review for the base game, which puts me in an awkward position. I bet Vlaada Chvatil wouldn't have that problem if he wrote reviews. Vlaada is one of the most inventive games designers in the industry. Even when he produces a game I have no interest in, I have to stop and admire his handiwork because it contains such a startling amount of originality. Every game he produces is significantly different from the last. Every game is inventive. And his games are funny too, dammit. I reckon if you were to jam a spigot in the back of his head, you'd get enough frothy brain goodness out to fill a bathtub. So, yeah. 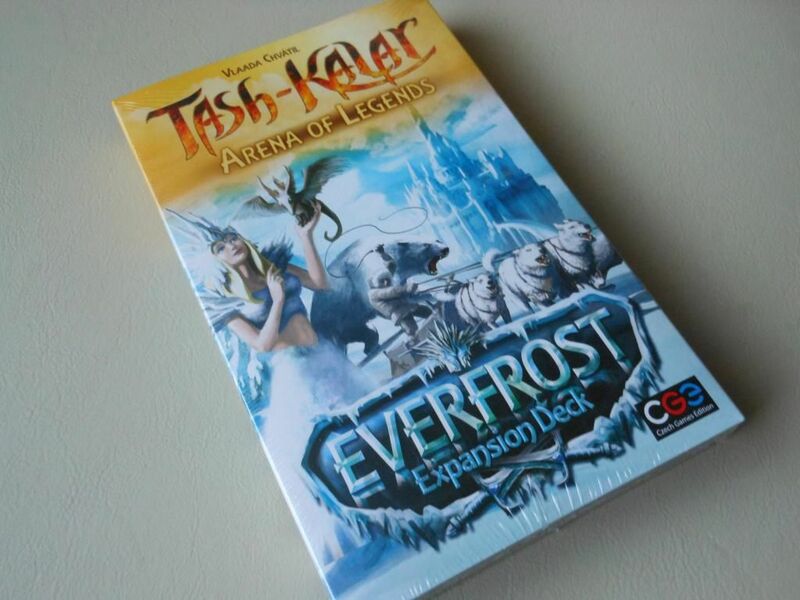 I think Vlaada would probably have something fun and creative to say in his review for the awesome Everfrost expansion. The Everfrost expansion is actually the kind of expansion I really like. It doesn't overcomplicate the base game, or add lots of fiddly new rules. It just gives you a bit more of the stuff you already like. In this case, if gives you a new race deck to play with. With an ethereal, wintery vibe that is just right for this time of year, Everfrost immediately stands out as one of the most attractive card decks available for the game. The artwork is from the talented David Cochard, and it evokes the magic and mystery of the ice-bound creatures perfectly. 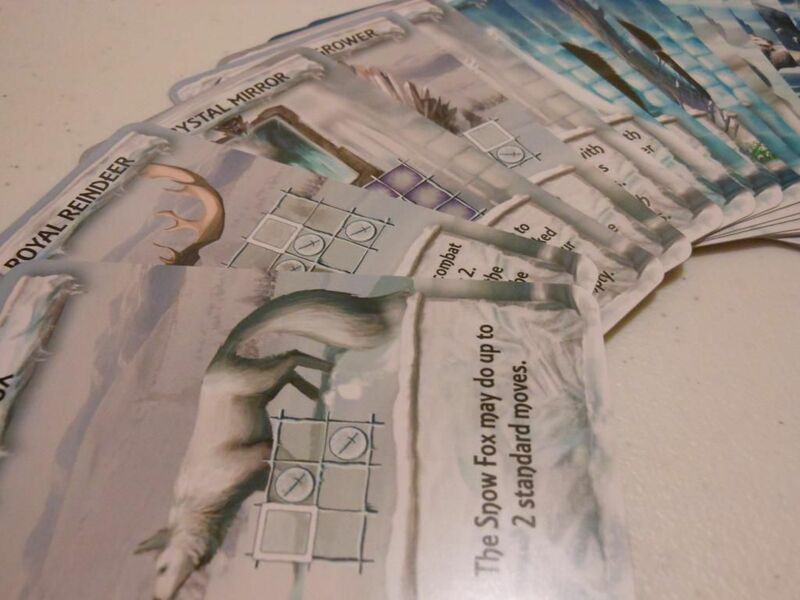 From the lithe winter fox to the gigantic glacial giant, every card is a joy. A fox in socks on icy blocks. The Everfrost deck once again exhibits Vlaada's ability to blend rules with theme in a seamless way. For example, this deck contains creatures that are almost the embodiment of a glass (ice) cannon: They can destroy other pieces, sometimes even legends, but in doing so they shatter into pieces. However, it is the way the cards work together that truly highlights the beauty of the design. Study the shapes you need to make to create each creature, and then consider the powers each creature has. To get your "creature engine" up and running, you need an "ice block" in a 3x3 grid, and then you can grow outwards like ice crystals by utilising the sliding abilities that many creatures possess. There are even powers that allow you to downgrade or upgrade creatures, perfectly encapsulating the freezing and thawing aspect of the winter wastelands. It's freaking beautiful, and I am totally in love with it. 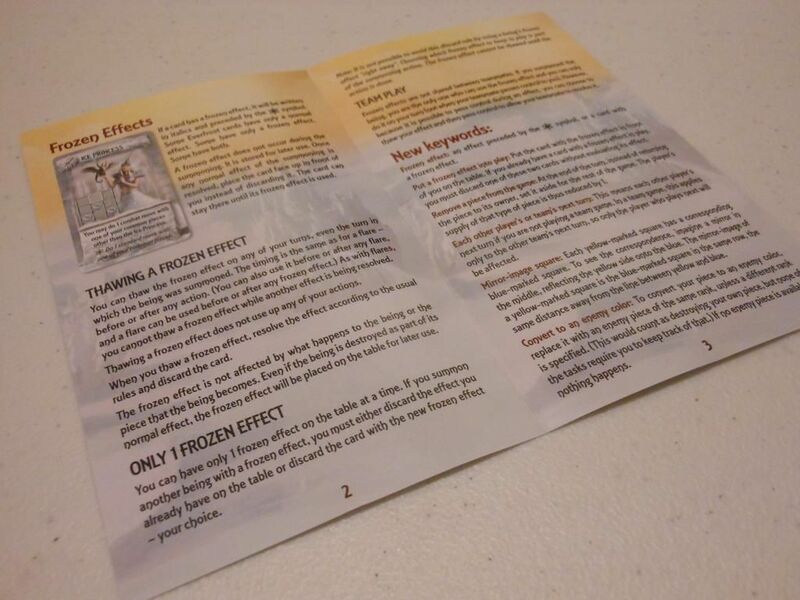 And I haven't even mentioned the one new rule this deck introduces: The frozen effects. These are abilities on creatures that you do not have to trigger immediately, Instead, you set them aside, and you can activate them whenever you want at a later date (this is known as "thawing" a frozen effect). This is a tricky and nuanced new mechanism. Just when you think you have grasped it, it slips through your fingers like a snowflake. But if you can get the hang of it, if you can resist the temptation to fire off the abilities as soon as you can rather than biding your time, this is a deck that really brings the pain. The new frozen effect rules. It takes time. It takes patience. The deck moves like a glacier as you slowly build your position of power. But when it strikes, it strikes like an avalanche. I have always been a huge fan of the Forest deck, but at the moment Everfrost is a close second for me. The wintery scoreboard for the expansion. And of course, one of the best things about this expansion is that it negates one of my few complaints with the base game. 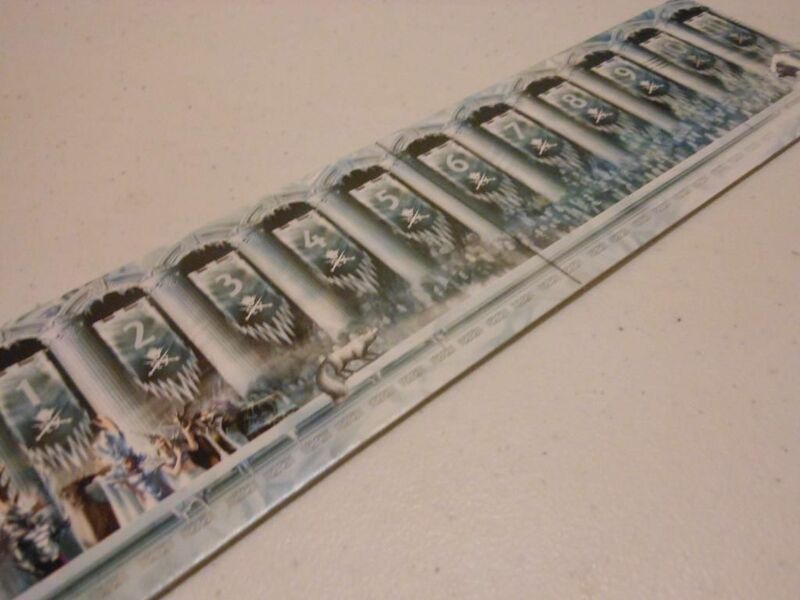 Originally, although four people could play, two players had to play with identical Empire decks. 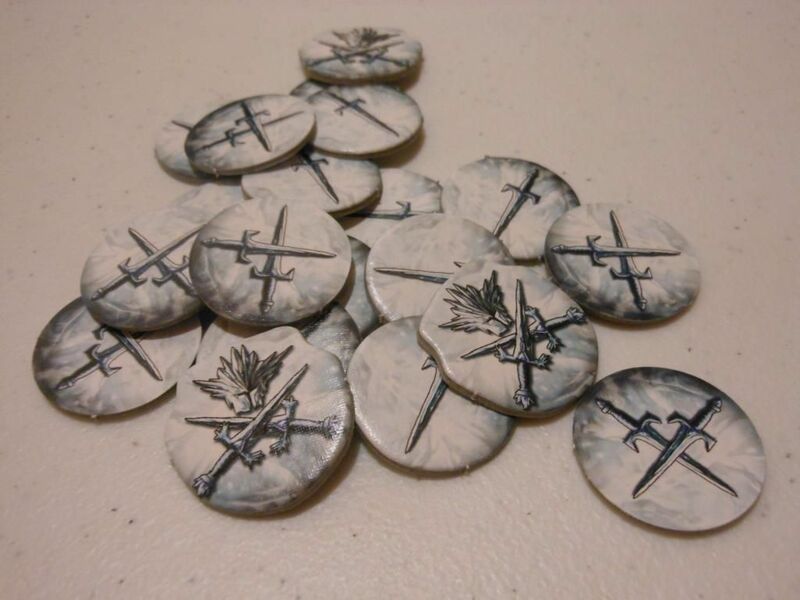 Now, it is possible for four unique factions to battle it out in the arena, which is a far more exciting prospect. But the very best thing of all? It does give me a little warm glow inside to think that in some tiny way I may have helped to shape the final product. It's almost enough to melt my heart. I recently got the base game and fell in love with the game. Now you show me this and I think.. well.. maybe I need this now... just maybe. As always, I love your reviews. You do need this. You really do. It is amazing how each deck plays so differently, and how the theme of each race is so evident in the play style. 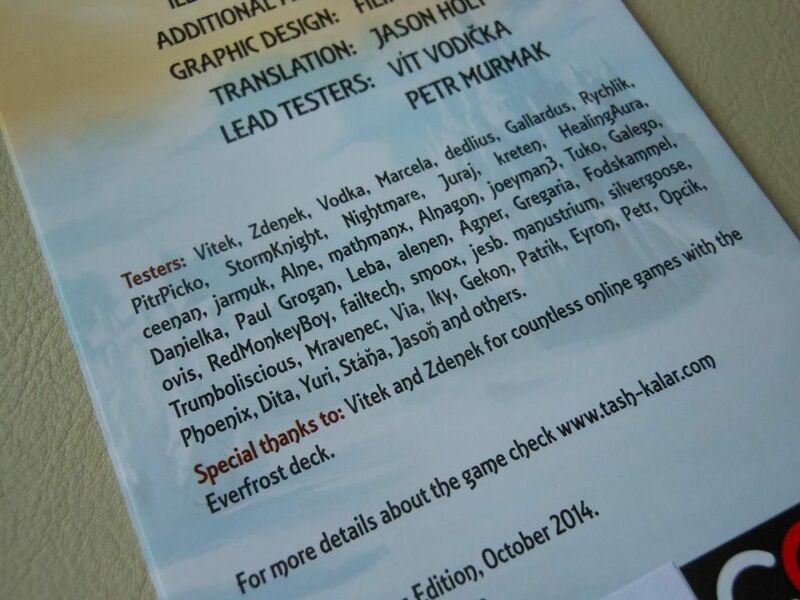 One thing I did find interesting is that the Everfrost deck does not make use of the green and red spaces on the board. As it stands, there is only one deck that takes advantage of those spaces, so I can see another expansion in the future.